They are so soft. The white is lush! The smell of my animal I One was hard to get out but no stain. The backing is durable so I think the extra washing won’t break it down. 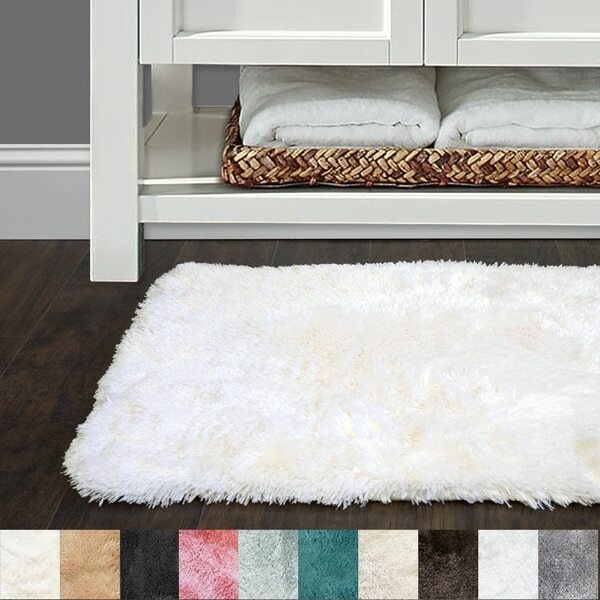 Pamper your feet with these super-soft faux fur bath rugs from Sweet Home Collection in 10 understated hues to match any bath decor. Available in small, medium and large sizes so you're sure to find the perfect fit: 17 inch by 24 inch, 20 inch by 32 inch and 24 inch by 40 inch. Made of Ultra Soft, Super Absorbent, 100% Microfiber. Anti-slip backing keeps these rugs safely in place. Machine wash cold/delicate. All sizes and colors sold separately, mix and match to meet your bathroom decor needs. I recently bought this rug for my dad's room. For Father's Day my sisters and I had it remodeled. New flooring, painted walls etc. And this rug in the white went perfect with the dark wood flooring, white curtains with the beachy themed paint color. He liked the softness of the rug. My dad is an 83yr old minister so he prays a lot and I bought this rug to be soft on his knees as he is kneeling in prayer. These are super soft but do not absorb water well. This rug is so soft and comfy! It’s a little lighter than I expected but it’s stull works for me. It’s a beautiful color coral that I’m going to use in my bathroom with my new flamingo shower curtain! This is a great price and well worth buying! Use it as a chair cover. Looks great. I use it as a chair protector. My dog jumps up on my leather lounge chair when I'm away from home. This protects the chair from him. Looks great! And it's washable! So far I love these. The ivory color is exactly what I wanted. Very soft and thick. This rug is absolutely beautiful.....very well made! These rugs are super soft and luxurious. I initially brought them for my guest bathroom, but after feeling how soft they were I decided these are going in my master bath. My husband rarely pays attention to these types of thing but he even commented after stepping out of the shower "Wow! What did you do to the rugs they're so soft? I bought new ones. I will be purchasing another set for the guest bath now. Sorry to say it is poor quality. First product not happy with from Over Stock. Nice size and texture, some threads do seem to come out easily, like it is "shedding", but overall, it has a luxe feel and appearance. Silky and soft to touch! Cream color was just the one I wanted and it looks great in my bathroom. Delivery and packaging was excellent! Thank you Overstock! this is a beautiful, soft rug that fits in perfectly with my real bathroom. it is wonderful quality for the price, but to mention its generous size. this item was well worth it! Lovely feel for bare feet! Nice thickness and pretty color. I bought this for my sister. But I open it to make sure the size was right. OMG!! The rug is like a baby bottom, so soft. She's going to like it. Warm, soft, really looks like fur. Perfect and at a good price. "I just received the Austin Horn En ‘Vogue Gold towel set. Do you know if these rugs the same shade of gold? They look like it from the photo but ya never know!!! " Unfortunately, these sets have not be compared. "does this rug come in a set like a set of three or I buy each one individually"
No, this is only sold individually. Was able to get color I wanted for my bath. 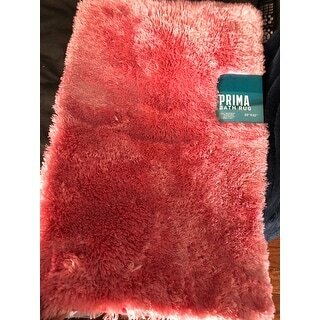 Have a large bath and feel that by purchasing 3 of these rugs, it would be more comfortable and durable.